LWS team members LeighAnn Frommann and Max Steinman stopped by the Padmapper/Zumper head office this past February. Thorold, ON Padmapper, who won a Rental Marketing Award for Best Mobile Website at WEBCON 2016, finally received their coveted trophy. 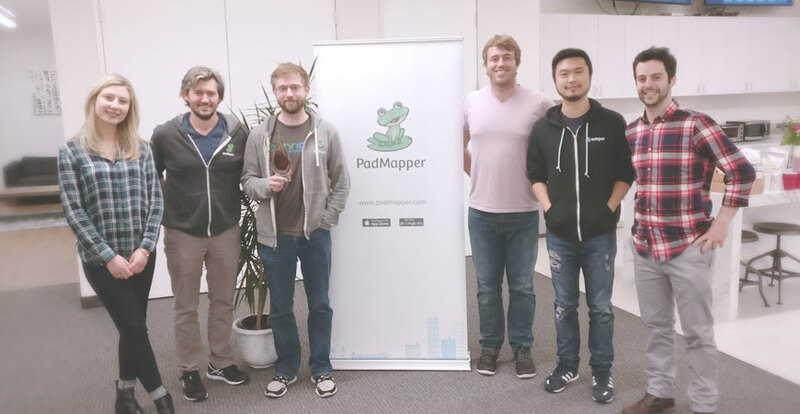 Unable to attend the event, the Padmapper team was excited to host the LWS team, who were visiting the San Francisco area, and receive their award. "It's always nice to get recognition from your customers," says Brian Coyne, Director of Sales for Padmapper. "Canadian landlords have really embraced Padmapper in the last 18 months and for that, we are very grateful." For LeighAnn and Max, the visit was one of the highlights of a whirlwind trip that took them to the Bay area, Napa, Vancouver and Winnipeg. Max adds, "We're big fans of Padmapper. After meeting their team, it's easy to see why they're exploding on the scene the way they are." Stay tuned for updates on this year's Rental Marketing Awards. To receive updates, sign up here.